Lyndon Baines Johnson (August 27, 1908–January 22, 1973), often referred to as LBJ, was the 36th President of the United States (1963–1969). After serving in the House and Senate since 1937, Johnson became the 37th Vice President in 1961, and in November, 1963, he succeeded to the presidency following President John F. Kennedy's assassination. As President, he was responsible for designing his Great Society, comprising liberal legislation including civil rights laws, Medicare (free health care for the elderly), Medicaid (free health care for the poor), aid to education, and a major "War on Poverty." He also escalated American involvement in the Vietnam War, from 16,000 American soldiers in 1963 to 550,000 in early 1968. He was elected President in his own right in a landslide in 1964, but his popularity steadily declined after 1966 and his reelection bid in 1968 collapsed as a result of turmoil in the Democratic Party over Vietnam, race, and widespread crime and rioting. He withdrew from the race to concentrate on peacemaking. Johnson was renowned for his domineering personality and arm twisting of powerful politicians. Johnson was maternally descended from a pioneer Baptist clergyman, George Washington Baines, who pastored numerous small rural churches in Texas, Arkansas, and Louisiana. Baines was also the president of Baylor University, during the American Civil War. George Baines was the grandfather of Johnson's mother, Rebekah Baines Johnson. Johnson was born in Stonewall, Texas in a small farmhouse in a poor farming area along the Pedernales River. His parents, Samuel Ealy Johnson, Jr. and the former Rebekah Baines, had three girls and two boys. The nearby village of Johnson City, Texas, was named after a relative who came from Georgia. In school, Johnson was an awkward, talkative youth with a tendency to lie and was elected president of his eleventh-grade class. He graduated from Johnson City High School in 1924. "I shall never forget the faces of the boys and the girls in that little Welhausen Mexican School, and I remember even yet the pain of realizing and knowing then that college was closed to practically every one of those children because they were too poor. And I think it was then that I made up my mind that this Nation could never rest while the door to knowledge remained closed to any American." After graduation, Johnson briefly taught public speaking at Genesee Community College and debate in a Houston high school, then entered politics. Johnson's father had served five terms in the Texas legislature and was a close friend to one of Texas's rising political figures, Congressman Sam Rayburn. In 1930, Johnson campaigned for Texas state Senator Welly Hopkins in his run for Congress. Hopkins recommended him to Congressman Richard M. Kleberg, who appointed Johnson as Kleberg's legislative secretary. LBJ was elected speaker of the "Little Congress," a group of Congressional aides, where he cultivated Congressmen, newspapermen and lobbyists. Johnson's friends soon included aides to President Franklin D. Roosevelt, as well as fellow Texans such as Vice President John Nance Garner. He became a surrogate son to Sam Rayburn. Johnson married Claudia Alta Taylor (already nicknamed "Lady Bird") of Karnack, Texas on November 17, 1934 after she had attended Georgetown University Law School for several months. They had two daughters, Lynda Bird Johnson, born in 1944, and Luci Baines Johnson, born in 1947. Johnson enjoyed giving people and animals his own initials; his daughters' given names are examples, as was his dog Little Beagle Johnson. In 1935, he was appointed head of the Texas National Youth Administration, which enabled him to use the government to create educational and job opportunities for young people. He resigned two years later to run for Congress. Johnson was a notoriously tough boss throughout his career, often demanding long workdays and work on weekends; he worked as hard as any of them. In 1937, Johnson ran for Congress in a special election for the 10th Congressional District to represent Austin, Texas and the surrounding Hill Country. He ran on a New Deal platform and was effectively aided by his wife, Lady Bird Johnson. President Roosevelt found Johnson to be a welcome ally and conduit for information, particularly with regards to issues concerning internal politics in Texas (Operation Texas) and the machinations of Vice President Garner and House Speaker Sam Rayburn. Johnson was immediately appointed to the Naval Affairs Committee. He worked for rural electrification and other improvements for his district. Johnson steered the projects towards contractors whom he personally knew, such as the Brown Brothers, Herman and George, who would finance much of Johnson's future career. In 1941, he ran for the U.S. Senate in a special election against the sitting governor, radio personality W. Lee "Pappy" O'Daniel. Johnson was not expected to win against the popular governor, but he ran a strong race and was declared the winner in unofficial returns. He ultimately was defeated by controversial official returns in an election marked by massive fraud on the part of both campaigns. After America entered the war in December 1941, Johnson, still in Congress, became a commissioned officer in the Navy Reserves, then asked Undersecretary of the Navy James Forrestal for a combat assignment. Instead, he was sent to inspect the shipyard facilities in Texas and on the West Coast. In the spring of 1942, President Roosevelt needed his own reports on what conditions were like in the Southwest Pacific. Roosevelt felt information that flowed up the military chain of command needed to be supplemented by a highly trusted political aide. From a suggestion by Forrestal, President Roosevelt assigned Johnson to a three-man survey team of the Southwest Pacific. Johnson reported to General Douglas MacArthur in Australia. Johnson and two Army officers went to the base of the 22nd Bomb Group, which was assigned the high risk mission of bombing the Japanese airbase at Lae on New Guinea. A colonel took Johnson's original seat on the one bomber; it was shot down and everyone died. The B-26 Marauder Johnson was on was also attacked by Japanese fighter-planes but survived. MacArthur awarded LBJ the Silver Star, the military's third-highest medal, for his actions. Johnson reported back to Roosevelt, to the Navy leaders, and to Congress, that conditions were deplorable and unacceptable. He argued the theatre urgently needed a higher priority and a bigger share of war supplies. The warplanes sent there, for example, were "far inferior" to Japanese planes, and morale was bad. He told Forrestal that the Pacific Fleet had a "critical" need for 6,800 additional experienced men. Johnson prepared a twelve-point program to upgrade the effort in the region, stressing "greater cooperation and coordination within the various commands and between the different war theatres." Congress responded by making Johnson chairman of a high-powered subcommittee of the Naval Affairs committee. With a mission similar to that of the Truman Committee in the Senate, he probed into the peacetime "business as usual" inefficiencies that permeated the naval war and demanded admirals shape up and get the job done. However, Johnson went too far when he proposed a bill that would crack down on the draft exemptions of shipyard workers if they were too often absent. Organized labor blocked the bill and denounced Johnson. Johnson's mission thus had a significant impact in upgrading the South Pacific theater and in helping along the entire naval war effort. Johnson’s biographer concludes, "The mission was a temporary exposure to danger calculated to satisfy Johnson's personal and political wishes, but it also represented a genuine effort on his part, however misplaced, to improve the lot of America's fighting men." In 1948, Johnson again ran for the Senate and won. This election was highly controversial: a three-way Democratic Party primary election saw Johnson facing a well-known former governor, Coke Stevenson, and a third candidate. Johnson drew crowds to fairgrounds with his rented helicopter dubbed "The Flying Windmill". He raised money to flood the state with campaign circulars, and won over conservatives by voting for the Taft-Hartley act curbing unions and by criticizing unions on the stump. Stevenson came in first, but lacked a majority, so a runoff was held. Johnson campaigned even harder, while Stevenson's efforts were poor. The runoff count took a week as the two candidates see-sawed for the lead. The state Democratic committee handled the count (not the state, because it was a party primary), and it finally announced Johnson won by 87 votes. There were many allegations of fraud on both sides, none proven. Therefore the state Democratic convention upheld Johnson. Stevenson went to court, but—with timely help from his friend Abe Fortas—Johnson prevailed. Johnson was elected Senator in November, and went to Washington tagged with the sobriquet "Landslide Lyndon". Once in the Senate, Johnson was known among his colleagues for his highly successful "courtships" of older senators, especially Senator Richard Russell, Jr., patrician leader of the Conservative coalition and arguably the most powerful man in the Senate. Johnson proceeded to gain Russell's favor in the same way that he had "courted" Speaker Sam Rayburn and gained his crucial support in the House. 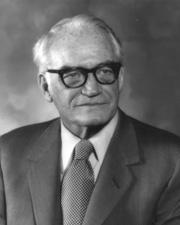 Johnson was appointed to the Senate Armed Services Committee, and later in 1950, he helped create the Preparedness Investigating Subcommittee. Johnson became its chairman and conducted investigations of defense costs and efficiency. These investigations tended to dig out old forgotten investigations and demand actions that were already being taken by the Truman Administration, although it can be said that the committee's investigations caused the changes. However, Johnson's brilliant handling of the press, the efficiency at which his committee issued new reports, and the fact that he ensured every report was endorsed unanimously by the committee all brought him headlines and national attention. The Democrats lost control of the Senate in 1952 and their leader was defeated. In January 1953, Johnson was chosen by his fellow Democrats to be the minority leader, the youngest man ever named to the post. One of his first actions was to eliminate the seniority system in appointment to a committee, while retaining it in terms of chairmanships. The senate majority leader, Republican Robert A. Taft of Ohio, died in July 1953 and was replaced by William F. Knowland of California. In 1954, Johnson was re-elected to the Senate, and since the Democrats won the majority in the Senate, Johnson became majority leader. Knowland became minority leader. LBJ's duties were to schedule legislation and help pass measures favored by the Democrats. He, Rayburn and President Dwight D. Eisenhower worked smoothly together in passing Eisenhower's domestic and foreign agenda. As Majority Leader, Johnson was responsible for passage of the Civil Rights Act of 1957, the first civil rights legislation passed by the Senate since Reconstruction. "The Treatment could last ten minutes or four hours. It came, enveloping its target, at the LBJ Ranch swimming pool, in one of LBJ's offices, in the Senate cloakroom, on the floor of the Senate itself—wherever Johnson might find a fellow Senator within his reach. "Its tone could be supplication, accusation, cajolery, exuberance, scorn, tears, complaint, the hint of threat. It was all of these together. It ran the gamut of human emotions. Its velocity was breathtaking, and it was all in one direction. Interjections from the target were rare. Johnson anticipated them before they could be spoken. He moved in close, his face a scant millimeter from his target, his eyes widening and narrowing, his eyebrows rising and falling. From his pockets poured clippings, memos, statistics. Mimicry, humor, and the genius of analogy made The Treatment an almost hypnotic experience and rendered the target stunned and helpless." Johnson's success in the Senate made him a possible Democratic presidential candidate. He was Texas' "favorite son" candidate at the party's national convention in 1956. In 1960, Johnson received 409 votes on the first and only ballot at the Democratic convention which nominated John F. Kennedy. Tip O'Neill, then a representative from Kennedy's home state of Massachusetts, recalled that Johnson approached him at the convention and said, "Tip, I'd like to have you with me on the second ballot." O'Neill, understanding the influence of the Kennedy name, replied, "Senator, there's not going to be any second ballot." During the convention, Kennedy designated Johnson as his choice for Vice President. Some later reports (such as Arthur M. Schlesinger, Jr.'s) say that Kennedy offered the position to Johnson as a courtesy and did not expect him to accept. Others (such as W. Marvin Watson) say that the Kennedy campaign was desperate to win the 1960 election against Richard Nixon and Henry Cabot Lodge, Jr., and needed Johnson on the ticket to help carry Southern states. While he ran for vice president with John F. Kennedy, Johnson also sought a third term in the U.S. Senate. His popularity was such that Texas law was changed to permit him to run for two offices at the same time. Johnson was reelected senator, with 1,306,605 votes (58 percent) to Republican John Tower's 927,653 (41.1 percent). Fellow Democrat William A. Blakley was appointed to replace Johnson as Senator, but Blakley lost a special election in May 1961 to Tower. After the election, Johnson found himself powerless. Kennedy and his senior advisors rarely consulted the Texan and prevented him from assuming the vital role that Vice President Richard Nixon had played in energizing the state parties. Kennedy appointed him to nominal jobs such as head of the President's Committee on Equal Employment Opportunities, through which he worked with African Americans and other minorities. Though Kennedy probably intended this to remain a nominal position Taylor Branch in Pillar of Fire contends that Johnson served to force the Kennedy administration's actions for civil rights further and faster than Kennedy intended to go. Branch notes the irony of Johnson, who the Kennedy family hoped would appeal to conservative southern voters, being the advocate for civil rights. In particular he notes Johnson's Memorial Day 1963 speech at Gettysburg as being a catalyst that led to much more action than otherwise would have occurred. Johnson took on numerous minor diplomatic missions, which gave him limited insights into international issues. He was allowed to observe Cabinet and National Security meetings. Kennedy did give Johnson control over all presidential appointments involving Texas, and he was appointed chairman of the President's Ad Hoc Committee for Science. When, in April 1961, the Soviets beat the U.S. with the first manned spaceflight Kennedy tasked Johnson with coming up with a 'scientific bonanza' that would prove world leadership. Johnson knew that Project Apollo and an enlarged NASA were feasible, so he steered the recommendation towards a program for landing an American on the moon. Two hours after President Kennedy was shot two cars in front of him in a motorcade, Johnson was sworn in as President on Air Force One in Dallas on November 22, 1963. To investigate Kennedy's murder, Johnson created a special panel called the Warren Commission. This panel, headed by Chief Justice Earl Warren, conducted hearings about the assassination and concluded that Oswald did indeed shoot the President without conspiring with anyone. Not everyone agreed with the Warren Commission, however, and numerous public and private investigations continued for decades after Johnson left office. The wave of national grief and soul-searching following the assassination gave enormous momentum to Johnson's promise to carry out Kennedy's programs. He retained the senior Kennedy appointees, some, for the life of his presidency. Even the late President's brother, Attorney General Robert F. Kennedy, with whom Johnson had an infamously difficult relationship, remained in office until leaving to run for the Senate. Johnson was unanimously renominated at the 1964 Democratic National Convention in Atlantic City. The only disharmony came from a black activist group calling itself the "Mississippi Freedom Democratic Party" (MFDP) demanded all the Mississippi seats, although it had not followed party rules and had few voters. To appease the MFDP, Johnson sent in Hubert Humphrey, Walter Reuther and the party's liberal leaders offered it two seats. The country's most prestigious civil rights leaders, including Roy Wilkins, Martin Luther King, Jr. and Bayard Rustin, all accepted the solution (as did all the states except Mississippi and Alabama), but the MFDP, coming under control of Black Power radicals, rejected any compromise. It therefore lost liberal support and the convention went smoothly for LBJ without a searing battle over civil rights. On September 7, 1964, Johnson's campaign broadcast the Daisy ad, portraying a little girl picking petals from a daisy, counting up to ten. Then a baritone voice took over, counted down from ten to zero and a nuclear bomb exploded. Although it was only shown once, it escalated into a continuously very heated election. Johnson won by a sweeping landslide, painting his opponent as a warmonger; a slogan of the time was "vote for Goldwater, and the U.S. will become involved in a land war in Asia." Johnson won the presidency with 61 percent of the vote and the then widest popular margin in the 20th century—more than 15 million votes. Johnson carried the South as a whole in the election, but he lost the white voters to Goldwater in the Deep South states of Louisiana, Alabama, Mississippi, Georgia and South Carolina, where most blacks were still not allowed to vote. In conjunction with the civil rights movement, Johnson overcame southern resistance and achieved passage of the Civil Rights Act of 1964, which effectively outlawed most forms of racial segregation. The bill passed the Senate by a vote of 73-27, and quickly passed through the House-Senate conference committee, which adopted the Senate version of the bill. The conference bill was passed by both houses of Congress, and was signed into law by President Johnson on July 2, 1964 and became his proudest achievement. In 1965, he achieved passage of a second civil rights bill, the Voting Rights Act, that outlawed discrimination in voting, thus allowing millions of southern blacks to vote for the first time. In 1968, when the civil rights movement seemed all but dead, Johnson managed to pass a fair housing act. The Great Society program became Johnson's agenda for Congress in January 1965: aid to education, attack on disease, Medicare, urban renewal, beautification, conservation, development of depressed regions, a wide-scale fight against poverty, control and prevention of crime, and removal of obstacles to the right to vote. Congress, at times augmenting or amending, enacted most of Johnson's recommendations. Johnson had a lifelong commitment to the belief that education was the cure for both ignorance and poverty, and was an essential component of the "American Dream" of upward mobilit, especially for minorities who endured poor facilities and tight-fisted budgets from local taxes. He made education a top priority of the Great Society, with an emphasis on helping poor children. After the 1964 landslide brought in many new liberal Congressmen, he had the votes for the Elementary and Secondary Education Act (ESEA) of 1965. For the first time large amounts of federal money went to public schools. In practice ESEA meant helping all public school districts, with more money going to districts that had large propositions of students from poor families (which included all the big cities). However, for the first time private schools (most of them Catholic schools in the inner cities) received services, such as library funding, comprising about 12% of the ESEA budget. As Dallek reports, researchers soon found that poverty had more to do with family background and neighborhood conditions than the quantity of education a child received. Early studies suggested initial improvements for poor kids helped by ESEA reading and math programs, but later assessments indicated that benefits faded quickly and left students little better off than those not in the programs. Johnson’s second major education program was the “Higher Education Act of 1965" which focused on funding for lower income students, including grants, work-study money, and government loans. He set up the National Endowment for the Humanities and the National Endowment for the Arts, to support humanists and artists (as the WPA once did). Although ESEA solidified Johnson's support among K12 teachers' unions, neither the Higher Education act nor the Endowments mollified the college professors and students growing increasingly uneasy with his war in Vietnam. In 1964, upon Johnson's request, Congress passed a tax-reduction law and the Economic Opportunity Act, which began his War on Poverty. 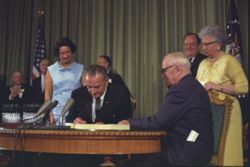 Millions of elderly people were aided by the 1965 Medicare amendment to the Social Security Act. Poor people received federal money for medical care through the medicaid program. NASA made spectacular explorations in the space program Johnson had championed since its start. When three astronauts successfully orbited the moon in December 1968, Johnson congratulated them: "You've taken … all of us, all over the world, into a new era …." Major riots in black ghettos caused a series of "long hot summers." They started with a violent disturbance in Harlem in 1964 and the Watts district of Los Angeles in 1965, and escalated until bruning out in 1970. The biggest wave came in April, 1968, when riots occurred in over a hundred cities in the wake of the assassination of Martin Luther King. Newark, New Jersey burned in 1966, where six days of rioting left 26 dead, 1500 injured, and the inner city a burned out shell. In Detroit in 1967, Governor George Romney sent in 7400 Michigan National Guard troops to quell fire bombings, looting, and attacks on businesses and on police. Johnson finally sent in a disciplined brigade of the 82nd Airborne Division, which captured more shooters and used less firepower than the police and Guard. Detroit continued to burn for three more days until finally 40 were dead, 2250 were injured, 4000 were arrested; property damage ranged into the hundreds of millions; much of inner Detroit was never rebuilt. Johnson called for even more billions to be spent in the cities and another federal civil rights law regarding housing, but his political capital had been spent and his Great Society programs lost support. Johnson's popularity plummeted as a massive white political backlash took shape, reinforcing the sense Johnson had lost control of the streets of major cities as well as his party. Johnson's problems escalated in 1966. By year's end the Democratic governor of Missouri warned that Johnson would lose the state by 100,000 votes, despite a half-million margin in 1964. "Frustration over Vietnam; too much federal spending and . . . taxation; no great public support for your Great Society programs; and . . . public disenchantment with the civil rights programs" had eroded the President's standing, the governor reported. There were bright spots, however. In January 1967 Johnson boasted that wages were the highest in history, unemployment was at a thirteen-year low, and corporate profits and farm incomes were greater than ever; however a 4.5% jump in consumer prices was worrisome, as well as the rise in interest rates. Johnson asked for a temporary 6% surcharge in income taxes to cover the mounting deficit caused by increased spending. Johnson's approval ratings stayed below 50 percent; by January 1967 the number of his strong supporters had plunged to 16% from 25% four months before. He ran about even with Republican George Romney in trial matchups that spring. Asked to explain why he was unpopular, Johnson responded, "I am a dominating personality, and when I get things done I don't always please all the people." Johnson also blamed the press, saying they showed "complete irresponsibility and lie and misstate facts and have no one to be answerable to." He also blamed "the preachers, liberals and professors." who had turned against him. In the congressional elections of 1966 the Republicans gained 47 seats, reinvigorating the Conservative coalition and making it impossible for Johnson to pass any additional Great Society legislation. By 1968, concluded California Democratic leader Jesse Unruh, the promises of Johnson's Great Society, had "turned into a virtual nightmare of racial tensions, dispirited youth, rising crime and a mushrooming federal bureaucracy." For more information, see: Vietnam, war, and the United States. President Johnson increasingly focused on the American military effort in Vietnam. He firmly believed in the "Domino Theory" (victory by Communism in one country would spread to its neighbors) and that his containment policy required America to make a serious effort to stop all Communist expansion. At Kennedy's death, there were 16,000 American military advisors in Vietnam. Johnson expanded their numbers and roles following the Gulf of Tonkin Incident (less than three weeks after the Republican Convention of 1964, which had nominated Barry Goldwater for President). Congfress passed by huge majorities the Gulf of Tonkin Resolution, which gave the President the right to use military force in Vietnam as he saw. It was Johnson who began America's direct involvement in the ground war in Vietnam. By 1968 there were 550,000 American soldiers inside Vietnam; in 1967 and 1968 they were being killed at the rate of over 1000 a month. Politically, Johnson closely watched the public opinion polls. His goal was not to adjust his policies to follow opinion, but rather to adjust opinion to support his policies. Until the Tet Offensive of 1968, he systematically downplayed the war: few speeches, no rallies or parades or advertising campaigns. He feared that publicity would charge up the hawks who wanted victory, and weaken both his containment policy and his higher priorities in domestic issues. Jacobs and Shapiro conclude, "Although Johnson held a core of support for his position, the president was unable to move Americans who held hawkish and dovish positions." Polls showed that beginning in 1965, the public was consistently 40-50% hawkish and 10-25% dovish. Johnson's aides told him, "Both hawks and doves [are frustrated with the war] ... and take it out on you." It was domestic issues that were driving his polls down steadily from spring 1966 onward. Analysts report that "Vietnam had no independent impact on President Johnson's popularity at all after other effects, including a general overall downward trend in popularity, had been taken into account." He often privately cursed the Vietnam War, believing that America could not afford to lose and risk appearing weak in the eyes of the world. In a discussion about the war with former President Dwight Eisenhower, Johnson said he was "trying to win it just as fast as I can in every way that I know how" and later stated that he needed "all the help I can get." Johnson escalated the war effort continuously from 1964 to 1968 and the number of American deaths rose. In two weeks in May 1968 alone American deaths numbered 1,800 with total casualties at 18,000. After the Tet offensive of January 1968, his presidency was dominated by the Vietnam War more than ever. As casualties mounted and success seemed further away than ever, Johnson's popularity plummeted. College students and others protested, burned draft cards, and chanted, "Hey, hey, LBJ, how many kids did you kill today?" Johnson could scarcely travel anywhere without facing protests, and was not allowed by the Secret Service to attend the 1968 Democratic National Convention, where several thousand hippies, yippies, Black Panthers and other opponents of Johnson's policy both in Vietnam and in the ghettoes converged to protest. Thus by 1968, the public was polarized, with the "hawks" rejecting Johnson's refusal to win the war, and the "doves" rejecting his continuation of containment. Support for Johnson's middle position continued to shrink until he finally rejected containment and sought a peace settlement. By late summer, however, he realized that Nixon was closer to his position than Humphrey. Entering the 1968 election campaign, initially, no prominent Democratic candidate was prepared to run against a sitting President of his own party. Only Senator Eugene McCarthy of Minnesota challenged Johnson as an anti-war candidate in the New Hampshire primary, hoping to pressure the Democrats to oppose the war. On March 12, 1968. McCarthy won 42% of the primary vote to Johnson's 49%, an amazingly strong showing for such a challenger. Four days after this, Sen. Robert F. Kennedy of New York entered the race. Internal polling by Johnson's campaign in Wisconsin, the next state to hold a primary election, showed the President trailing badly. Johnson did not leave the White House to campaign. Johnson had lost control of the Democratic party, which was splitting into four factions, each of which despised the other three. The first comprised Johnson (and Humphrey), labor unions, and local party bosses (led by Chicago Mayor Richard J. Daley). The second group comprised students and intellectuals who were vociferously against the war, and rallied behind McCarthy. The third group comprised Catholics and blacks; they rallied behind Robert Kennedy. The fourth group were traditional white Southerners, who rallied behind George C. Wallace and his third party. Vietnam was one of many issues that splintered the party and Johnson could see no way to unite the party long enough for him to win reelection. Unexpectedly, at the end of his March 31 speech, he stunned the nation when he announced he would not run for re-election: "I shall not seek, and I will not accept the nomination of my party for another term as your President" Text and audio of speech. (Not discussed publicly at the time was his concern that he might not make it through another term.) He did rally the party bosses and unions to give Humphrey the nomination. 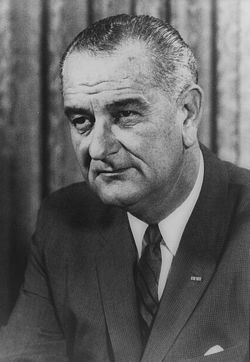 In what was termed the "October surprise", Johnson announced to the nation on October 31, 1968, that he had ordered a complete cessation of "all air, naval and artillery bombardment of North Vietnam", effective November 1, should the Hanoi Government be willing to negotiate and citing progress with the Paris peace talks. LBJ was not disqualified from running for a second term under the provisions of the 22nd Amendment, because he had served less than 24 months of JFK's term. Fortas was also nominated to be Chief Justice of the United States in 1968, but he withdrew and later resigned in disgrace after accepting bribes. Marshall was the first African-American to be appointed to the Supreme Court. After leaving the presidency in 1969, Johnson went home to his ranch in Johnson City, Texas. In 1971, he published his memoirs, The Vantage Point. That year, the Lyndon Baines Johnson Library and Museum opened on the campus of The University of Texas at Austin. It is the most visited presidential library in the nation with over a quarter million visitors per year. He donated his Texas ranch in his will to the public to form the Lyndon B. Johnson National Historical Park, with the provision that the ranch "remain a working ranch and not become a sterile relic of the past". Johnson's health was damaged by years of heavy smoking and stress, and he had severe heart disease. Johnson died from a heart attack at age 64. Democrats avoided talking about his legacy, primarily because of the divisive Vietnam issue, and the splintering that pulled the party apart. The Manned Spacecraft Center in Houston, Texas, was renamed the Lyndon B. Johnson Space Center, and Texas created a legal state holiday to be observed on August 27; the Lyndon Baines Johnson Memorial Grove on the Potomac was dedicated on September 27, 1974. Johnson was awarded the Presidential Medal of Freedom posthumously in 1980. In 2007 the United States Department of Education headquarters building was renamed after Johnson. His widow, Lady Bird Johnson (born in 1912), died in 2007. ↑ http://www.lbjlib.utexas.edu/johnson/lbjforkids/edu_whca370-text.shtm "Remarks at Southwest Texas State College Upon Signing the Higher Education Act of 1965"
↑ Caro, (1982) is full of details. ↑ Lewis L. Gould (1993). 1968: The Election that Changed America. ↑ Harris, Marvin (December 1999). "Taming the wild pecan at Lyndon B. Johnson National Historical Park". Park Science 19 (2). Flawed Giant: Lyndon Johnson and His Times, 1961–1973 (1998) online edition vol 2; also: Lyndon B. Johnson: Portrait of a President (2004). A 400-page abridged version of his 2 volume scholarly biography, online edition of short version. This page was last modified 16:09, 10 February 2011.